Few composers of the 20th Century have aroused such widespread interest as Béla Bartók. Of his 96 works, 55 had been recorded by the time Professor Stevens (of the University of Southern California) completed the discography which forms an appendix to his book, and these records were not made solely for love. Bartók cycles are now almost as common as Beethoven cycles among the string quartets on the university circuit, the music societies of the avant-garde would starve to death without his “Sonata for Two Pianos and Percussion,” and Life has published a series of photographs on the home life of Marilyn Monroe showing that shapely lady listening with rapture and, presumably, understanding to one of the great Hungarian’s works. Yet all of us can well afford to understand more about the Music of Béla Bartók, what it is, how it came to be, and where it fits in the history of the art as a whole. Rather strangely, the Bartók literature in English is both meager and fragmentary, or was until Halsey Stevens’ book appeared. Stevens, however, has done an extremely thorough and important job; how thorough is indicated by his learning Hungarian in order to read Bartók’s letters and other primary documents in the original. Stevens is being diplomatic here. The great majority of us have not “lost sight” of the direct line of Bartók’s development; we have never come close enough to see it at all, and because of his immense interest in Hungarian folklore we have permitted ourselves to regard Bartók as a special and somewhat exotic manifestation. But Stevens is right. Bartók is part of the main line. Stevens did not know Bartók personally and is not one of the inner circle of Bartókians who remain in New York. His biography is therefore constructed largely from the published record, but since most of this exists obscurely (for us) in Hungarian sources, his picture of Bartók’s career and personality is altogether fresh. One is struck by the backwardness and provinciality of the Hungarian musical life from which Bartók emerged; one had thought of Budapest as a cultural capital, but apparently it was not so. The musical atmosphere of Budapest, circa 1900, seems to have affected Bartók both positively and negatively – positively in that it made him a piano virtuoso, a teacher of piano, and the composer of a vast quantity of didactic and concert music for that instrument, negatively in that its romantic conservatism sparked his creative revolt. Stevens documents Bartók’s wanderings as a concert artist in the great world and as a folk-song collector in obscure corners of Europe, and he has much to tell about the desperate final years of Bartók’s life, when he hung on grimly in New York, fighting ill health and poverty, editing folk materials on a small stipend from Columbia University, and picking up whatever else might come his way in the form of commissions and concert engagements. If he had only agreed to teach composition all of this might have been avoided; he had several offers of positions as professor of composition, but he refused to accept them because he felt that the creation of music could not be taught. This is indicative of the stiff-necked independence that characterized his entire life, both at his own worktable and elsewhere. The section devoted to Bartók’s music is nearly three times as long as the section devoted to his life. This discussion is organized in terms of forms and media, with chapters on the piano music, the vocal music, the string quartets, the other chamber music, the concertos, the music for orchestra alone, and, finally, the dramatic music. Each work is deftly placed and characterized, and there are many extensive analyses. All of this is invaluable as a study of Bartók’s creative career as a whole and is equally important for reference in connection with the study of individual works. It is also worth while simply as an indication of what Bartók composed; one can see pianists, singers, and chamber music players, particularly, prowling Stevens’ pages for tips on program making. Naturally, Stevens devotes considerable attention to the relationship between Bartók’s own music and the folk music on which he was an authority, but he does not spend much time on Bartók’s work in folklore per se. This is a subject which calls for special study; it is of interest to a much smaller audience than that which listens to Bartók’s original creations, but in time it will receive more general attention than is given it now. So will the entire subject of Bartók as a writer on musical subjects, a field in which he was exceptionally prolific. Stevens lists no less that 14 books and 68 articles by Bartók, all of which remain to be worked over in the second wave of Bartók scholarship. Meanwhile the first wave is served with signal effectiveness in the present volume. 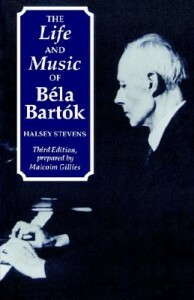 The sudden posthumous growth of the popular reputation of the late Béla Bartók appears to shore up the belief that important creative artists must die in order to win their proper positions in public estimation. To many of Bartók’s contemporaries who had no special knowledge of him, or who did not seek out modern music in its more private haunts, he was for a long time known as a appreciable, but somehow indeterminate, composer slightly oblique to the two or three main currents. He seemed to portion his considerable energy between authentic and winning arrangements of Hungarian and other Balkan folk music and the elaboration of uncompromising and often hostile large compositions of exotic originality. Then Bartók died and (or so it seemed), his music suddenly leaped to the wide popularity that had eluded him while he lived. Halsey Stevens’ admirable book corrects this picture in many details, but strengthens its general outlines. Bartók’s life did not altogether fail to bring him the pleasures of recognized achievement. But it was full of failures too, and its end in exile was a personal tragedy. Too, it demonstrated the added difficulties to which a creator may be subject if the place of his birth and growth happens to be slightly isolated from the main streams of contemporary artistic activity. Mr. Stevens nowhere says that Bartók’s forced removal from Hungary to the Unites States played an important role in the extraordinary flowering of his last years, but a reading of this book nonetheless, strongly suggests it. One third of this book is devoted to a well-told, expertly documented chronicle of Bartók’s personal and artistic life, from his birth in the Hungarian (now Romanian) town of Nagyszentmiklós on March 25, 1881, to his death far from home, in New York, on September 26, 1945. Mr. Stevens writes with an admirable feeling for what is revealing, interesting, and important. More searching psychological portraits of Bartók will be drawn, but in this pioneering study Mr. Stevens wisely hewed to the chronicler’s task, neither probing deeply nor expressing personal judgment with much intensity. He says simply that these are the facts, and we gratefully believe him. The latter two thirds of the book contain an explanatory chronicle of Bartók’s music, presented in six sections by genres. Here Mr. Stevens himself is more present, and the reading is therefore livelier. He avoids generalities, addressing himself constantly to the specific composition. Again the information is all here, its dependability patent. Its purpose is not to alter the reader’s overall opinion of Bartók’s music. But it will be of the very greatest help toward informed listening. In a day when few books on recent composers are very useful, this handsomely produced and interestingly illustrated one is exactly that.